Our costumes are ready, I am about to go dig up the glow sticks I saved for tonight and the tea lights are about to go into our jack o'lanterns. Before I know it, the boys will be collecting gobs of candy and the sugar rushes will be about to begin. For some unknown reason, our city (and most of Columbus) has opted to do trick or treating tonight instead of Saturday. God love the teachers that will have to contend with the sleep-deprived and sugar-hang over little ones tomorrow. This allows much of the flesh to sink to the bottom while the seeds float on top, making it much, much easier to remove the remaining flesh. 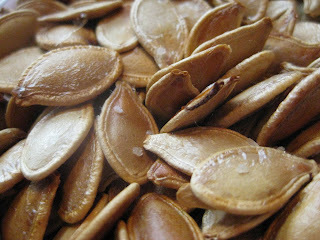 Go ahead and enjoy--they are a healthy snack full of good antioxidants and other nutrients. If you can, save some because I have a recipe I am trying out this weekend using them, and I will post it if it passes muster. 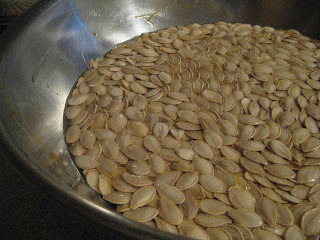 I roasted pumpkin seeds last night. The flavor was good, but I guess I don't like the hulls. 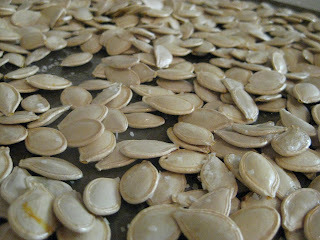 I would like to try hulling the seeds and then roasting. Have you ever done that? 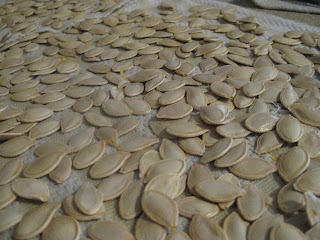 I'm so sad I didn't get to roast seeds this year again! Next year!